Cellphones are hazardous because they use a low level radio frequency that modifies the tissues of the body. When held close to the head, brain tumors are a significant outcome. Radio frequency is a type of non-ionizing radiation (does not knock electrons off atoms or molecules) that our bodies can easily absorb. It modifies the tissues of our bodies, especially areas that are most exposed to a cellphone. Human cells exposed to radio frequency develop “stress” proteins, according to research by Prof. Martin Blank, Ph.D., Columbia University’s Dept. of Physiology and Cellular Biophysics. Such proteins are used for protection, meaning the cell is saying radio frequency is bad and the cell has to do something about it, he says. This link shows people of all ages including children pressing cellphones to their ears. Prof. Blank described his findings in 2009 in a 16-page presentation to the State of Virginia which was considering an application of the Allegheny, Va., Transmission Corp. for certification of electric cable facilities. He provided 40 exhibits, 181 publication papers, 22 book reviews and 26 European scientific articles in support of his findings. More recently, 190 independent scientists from 39 nations, members of EMF Scientist.org met in May 2015 and drafted an “International EMF Scientist Appeal” based on 2,000 research studies. “We are scientists engaged in the study of biological and health effects of non-ionizing electromagnetic fields (EMF). Based upon peer-reviewed, published research, we have serious concerns regarding the ubiquitous and increasing exposure to EMF generated by electric and wireless devices. “These include–but are not limited to–radiofrequency radiation (RFR) emitting devices, such as cellular and cordless phones and their base stations, Wi-Fi, broadcast antennas, smart meters, and baby monitors as well as electric devices and infra-structures used in the delivery of electricity that generate extremely-low frequency electromagnetic field (ELF EMF). “Numerous recent scientific publications have shown that EMF affects living organisms at levels well below most international and national guidelines. Effects include increased cancer risk, cellular stress, increase in harmful free radicals, genetic damages, structural and functional changes of the reproductive system, learning and memory deficits, neurological disorders, and negative impacts on general well-being in humans. Damage goes well beyond the human race, as there is growing evidence of harmful effects to both plant and animal life. WHO in 2014 noted there are 6.9 billion mobile phone subscriptions worldwide while at the same time cancer is on the rise across the globe with 14 million new diagnoses made in 2012 alone. It’s estimated that 1,685,210 new cancer diagnoses would be made in the United States in 2016. 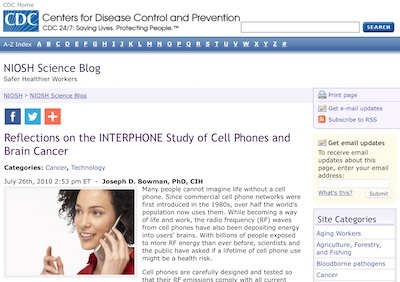 With the rampant increase of cellphone usage and cancer, scientists everywhere have been carrying out studies to explore any link between cellphone use and cancer. When cellphones are held close to the head, brain tumors are significant outcome. A 2009 Australian study found a correlation between cellphone use and glioma and acoustic neuroma, two types of brain tumors. Men who carry their mobile phones in their pocket also have an increased chance of testicular cancer and cancer of the breast is a possible outcome for women who carry their phones in their bras. Cancers of the lymph node, oral, skin, thyroid, pituitary, blood and the eye have been linked to cellphone use. It can induce memory loss, gene mutation, neurological disorders, sleep disorders, infertility and disintegration of the central nervous system. Mainstream media hardly tells us about the ramifications of our cellphone habits. On the other hand, the National Cancer Institute and WHO both have recognized how cancer can be an outcome when we use our cellphones excessively. According to the National Cancer Institute, factors taken into account when carrying out studies are how many calls per week or month do individuals make/receive; age and the year when individuals first began using a cellphone, and average length of a call. The more time spent in phone calls per day, the higher the risk of cancer. While complete avoidance is the best solution, one can practice prudence when using cellphones to reduce the risk of developing cancer or any other electromagnetic frequency-related ailments. • Text or video-call to keep your cellphone at a safe distance from the body. • Use earphones (no Bluetooth headsets) or put your phone on speaker mode. • Avoid carrying your phone in your pocket or bra. Put it in a bag instead. • Switch from cellphone to a landline if it’s going to be a long call. Or meet face-to-face. • Don’t use your cellphone when it is charging. • Unplug cordless phones at night or when not using. Lloyd Burrell is the founder of ElectricSense.com. His website offers solutions to the “growing number of people whose health is being compromised by exposure to wireless and similar technologies.” He offers a free EMF Health Report.